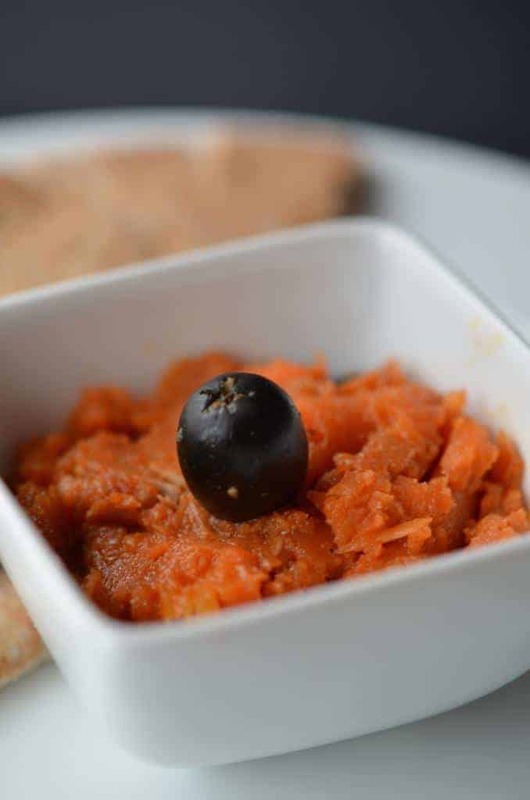 Spicy Carrot Salad puree? How on earth did I come up with this easy recipe? I did not. This Mediterranean dish was suggested by neighbor. I live in a multicultural neighborhood and sometimes we get together for a pot luck. In one of those gatherings, my neighbor brought this delicious carrot salad. It was a bit spicy but not too much. As you may have noticed, I like spicy food such as Patak Spicy sauces. I LOVED this carrot dish. It is an easy and simple recipe to make. It is usually served as an entree or appetizer with delicious baguette or pita. It can be perfect as a sandwich spread too. Since I discovered this easy healthy recipe, it became a staple in my home. My neighbor was delighted to provide me with the recipe. 4 cups of carrots diced. I used baby carrots. It is best with regular carrots but I did not have on hand. 1 tsp of curry paste. I used Blue Dragon’s. Remove carrots from water and puree. Serve with your favorite pita bread or baguette. This easy recipe is perfect to use as a holiday appetizer or just to enjoy for yourself as a quick yet unique healthy snack! If you like your food spicier, add a bit more of the hot chili pepper paste. Want to tone it down a bit? Use less. That’s the great thing about making your own spicy carrot salad paste, you control the heat! Would you enjoy this easy recipe as is, or turn up the heat in your carrot salad puree? Tell us in the comments, are you a mild, medium or spicy eater? I am a whimp and can not handle spicy food. I would love to eat spicy dishes like this as it sounds so easy to make and very tasty. Since my family loves carrots this would go over well at my house. My kids especially like carrots. I have never heard of a salad like this. I love carrots, this sounds amazing! I’ve never heard of a pureed carrot salad before. It sure does sound interesting. This sounds so delish!. Saving for my next get together. This sounds great to use as a dip for chips or other fresh veggies. Yum! This sounds absolutely delicious. Thank you for sharing it, I’m going to make it for my daughter ASAP. She likes foods that are spicy but not too spicy, and she loves trying new things. This is a really interesting way of preparing carrots. I’ll have to whip up a batch! This sounds really tasty. I love carrots, so I can’t wait to give this a try. My son LOVES carrots. I bet he would love trying this dip with crackers! I love carrots and spicy is always fun. This looks like a great way to add some flavor. That sounds absolutely phenomenal. I definitely want to try this!